"We want to send people home with resources; our biggest dream is to release a generation that can go out one-on-one and challenge each other on what it means to follow Jesus," he said. "We're gonna be equipping people at the gathering, walking them through training initiatives to help them share Jesus in their school, start a small group, plan social justice activities back home, use apologetics, and defend and answer the hard questions of faith." In a society marked by chaos and unrest, Together 2018 will focus on overcoming divisiveness by adopting a lifestyle mirroring the love and kindness of Jesus. "We're using these words 'move closer,'" Hall said. "The world is so divided, and Jesus is the only One who welcomes everyone. Yes, there is an exclusivity to it, but at the same time, Jesus welcomes both the sinner and saint. We call the gathering 'Together' because it's a generation going after Jesus together. As we draw closer to Jesus, we're brought closer to people who are hurting and broken and having a hard time." "We need to get over this mentality that, as believers, we can stay out of the brokenness and mess of this world," he continued. "If we're following Jesus, then we find ourselves where He is, and He's always with the least and the lost. Hall — himself a millennial — has shared the Gospel in person to nearly 4 million students over the years. 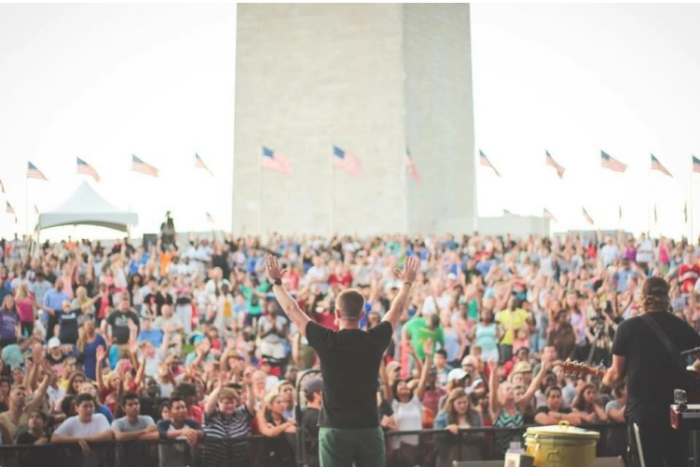 In 2016, the evangelist filled the National Mall in Washington, D.C. when more than 500,000 people gathered to hear the Gospel along with Christian music's top artists. He told CP that unlike previous generations, millennials and Gen Z tend to be particularly "cause driven," positioning them well to fulfill the Great Commission — something he believes will happen in our lifetime. "Millennials and Gen Z want a cause bigger than themselves," he said. "They're also passionate, and there's such a willingness to love, to serve, and to get their hands dirty. This is also the first generation where there isn't a division between the sacred and the secular; this generation understands that everything is ministry. If you know Jesus, then you are called to this work of being a light wherever you go. This generation wants to see Jesus made much of and for people everywhere to experience His love." He added, "Our hope is people come away not just with an incredible experience, but to go home with practical tools, so they feel they're better equipped and ready to go out and fulfill the Great Commission." To find out more about Together 2018 or to livestream the event, click here. Schools, Youth and Violence: Where Do We Go From Here?